Does a Space Mountain Single Rider line exist for the indoor roller coaster? Currently, Disney does not have a single rider line for Space Mountain at Walt Disney World. Walt Disney World does have a FastPass or FastPass+ line for Space Mountain. Through FastPass+ you will be able to get on the ride faster, however you must use Disney's electronic system either through the kiosks / cast members with tablets at the park or online via Disney's website or mobile apps. 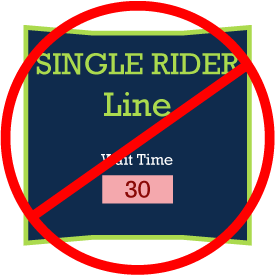 There is no Disney World Space Mountain single rider line that you can use to get on the ride faster. FastPass+ is the best option to get on the ride fast, however, you have to make a reservation through Walt Disney World's electronic system. In the Magic Kingdom there are no rides with a single rider / guest line. Epcot, Disney’s Hollywood Studios, and Disney’s Animal Kingdom have single rider lines at a few of their attractions. On November 20th, 2017, Inside the Magic reported that The Walt Disney Company is testing a single rider line for Space Mountain at Disneyland in California. It is not clear if this test is still in place and a single rider line will a be a continued option for the ride. Walt Disney World Resort offers a program that allows a party with children and guests who do not want to or can’t ride a certain attraction to have one adult wait with the non riding guests, while the other guests wait in line. Once the guests return from the ride the waiting person or persons can then move to the front of the line to ride the attraction. This program is called Rider Switch, however, some may refer to it as rider swap. This can be a way for guests to get to the front of the line “faster” while waiting with other guests outside the ride. Technically this can be like a Space Mountain single rider line, however, it is not a true single rider line like other rides have. The main purpose of this program is to allow guests that want to ride a certain ride, to have the ability to do so when other guests can’t go on the ride. To learn more about Space Mountain at the Magic Kingdom, visit the other pages here on the NavFile site.